The geology of the North Carolina coastal system influences rates and magnitudes of coastal change. The upper image is a perspective view of the inner continental shelf and nearshore bathymetry and the adjacent barrier island, looking onshore near Kitty Hawk, North Carolina. A pattern of shore-oblique bars is visible as the “corrugated” pattern in the blue-toned bathymetric map. 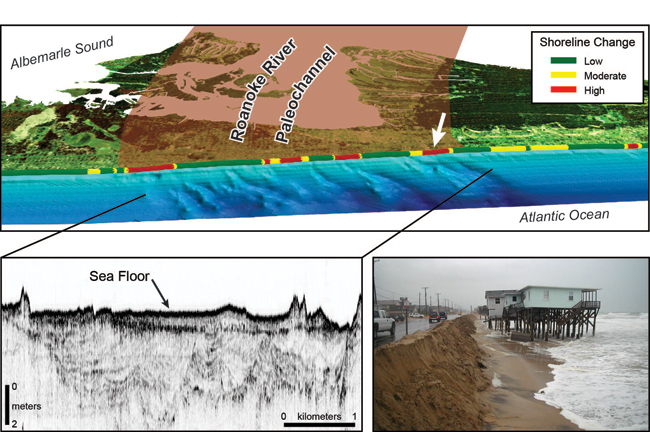 The shore-oblique bars appear to have an origin related to the presence of a variable shallow geologic framework, shown here in the seismic line (lower left image) as a large complex of cut and fill structures related to the Late Pleistocene course of the Roanoke River that passes underneath Kitty Hawk. These bars likely influence nearshore wave characteristics and the resulting sediment transport and erosion on the beach, which is shown in the alongshore-varying pattern of low, moderate and high shoreline change in the upper image. The white arrow in the upper image indicates the location of the photo at lower right. This location experiences relatively high magnitudes of shoreline change, particularly during storms when waves are large. Thieler, E.R., Foster, D.S., Mallinson, D.J., Himmelstoss, E.A., McNinch, J.E., List, J.H., and Hammar-Klose, E.S., 2013, Quaternary geophysical framework of the northeastern North Carolina coastal system: U.S. Geological Survey Open-File Report 2011-1015, https://pubs.usgs.gov/of/2011/1015/.